In 2014, the PHS made its home in the grassy lot right next to the Jamaican Jerk Hut at 15th and South streets. The popular South Street PHS Pop-Up Garden will open for the 2017 season on Friday, May 5. Since the date coincides with Cinco de Mayo festivities, the garden will host a fiesta on opening night. There will be specials from Cantina Los Caballitos, which will be providing the food & drink for the beer garden this season. Those who have visited the space previous years will notice a new design in the garden. There will be "romantic-rustic" elements and wildflowers, according to PHS' Facebook event page. Don't worry, though. The twinkling lights will still be there. As for food & drink, the bar menu features a mix of old and new. Favorites like The Woodermelon (vodka and watermelon juice) and The Bartram (gin, cucumber and lime juice) will still be served. What's new is an expanded margarita menu. Another new aspect is the Guest Chef Series. On the first and third Thursday of each month, a new chef will create cuisine for the garden. Hungry Pigeon and Federal Donuts have already signed on. On Tuesdays, the PHS pop-up will feature live music and beer specials from visiting breweries. 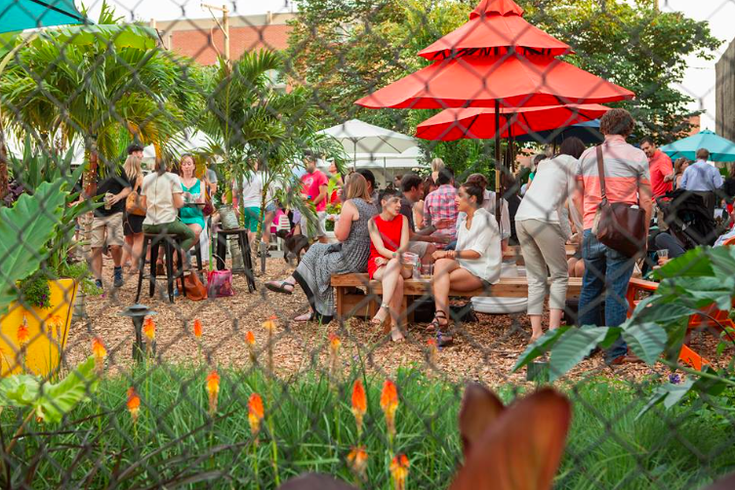 The South Street beer garden will be open Monday through Thursday from 5-10 p.m., Fridays from 5 p.m. to midnight, Saturdays from 2 p.m. to midnight and Sundays from noon to 10 p.m.
PHS will also open another pop-up at 36th and Filbert streets this summer. The opening date has not yet been announced.